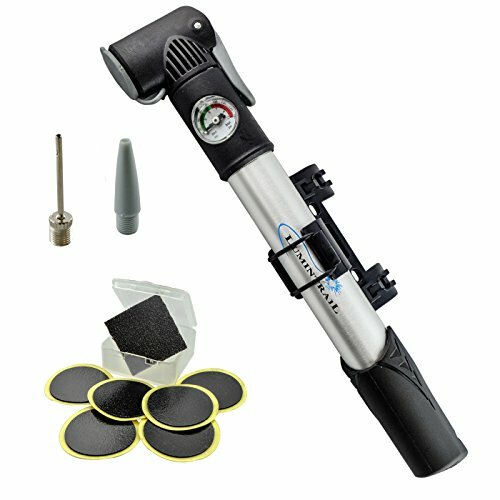 PRO QUALITY - DURABLE, COMPACT & LIGHTWEIGHT - Sturdy Aluminum Alloy construction provides long lasting usage while the Composite Barrel design provides high volume pumping power up to 120 PSI. Pump is small enough to carry in a pack or can be mounted on the frame. Pump measures approximately 11 inches long and weighs 7.4oz. EASY TO USE - Locking lever makes attaching adapters quick and easy. The Barrel features a convenient fold out handle for easy pump action and a Built-in Pressure Gauge to prevent damage from over inflation. BIKE FRAME MOUNT INCLUDED - Pump attaches easily and securely to your bike frame with the included Mounting Bracket. BONUS GLUELESS PUNCTURE REPAIR KIT - Mini Puncture Repair Kit comes in a compact portable case and includes 6 patches.